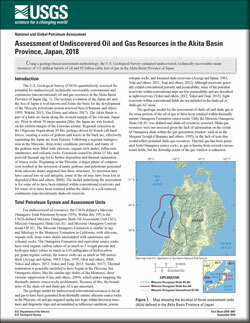 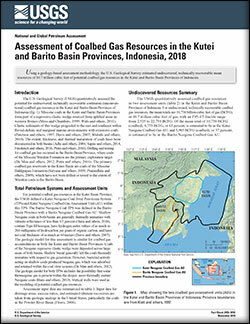 Using a geology-based assessment methodology, the U.S. Geological Survey estimated undiscovered, technically recoverable mean resources of 111 million barrels of oil and 85 billion cubic feet of gas in the Akita Basin Province of Japan. 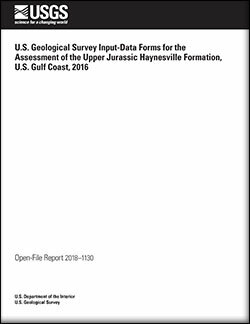 Schenk, Christopher J.; Mercier, Tracey J.; Tennyson, Marilyn E.; Woodall, Cheryl A.; Finn, Thomas M.; Le, Phuong A.; Marra, Kristen R.; Gaswirth, Stephanie B.; Leathers-Miller, Heidi M.; Drake, Ronald M.
Schenk, C.J., Mercier, T.J., Tennyson, M.E., Woodall, C.A., Finn, T.M., Le, P.A., Marra, K.R., Gaswirth, S.B., Leathers-Miller, H.M., and Drake, R.M., II, 2018, Assessment of undiscovered oil and gas resources in the Akita Basin Province, Japan, 2018: U.S. Geological Survey Fact Sheet 2018–3047, 2 p., https://doi.org/10.3133/fs20183047. 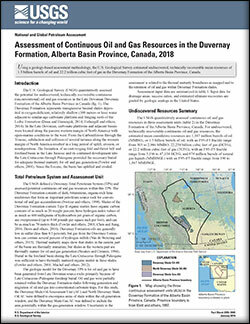 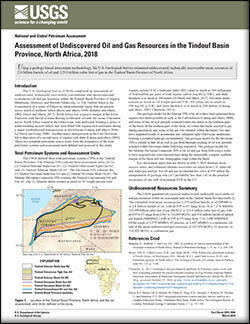 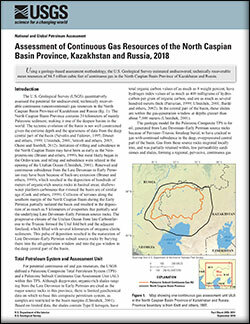 Using a geology-based assessment methodology, the U.S. Geological Survey estimated undiscovered, technically recoverable mean resources of 84.5 trillion cubic feet of continuous gas in the North Caspian Basin Province of Kazakhstan and Russia. 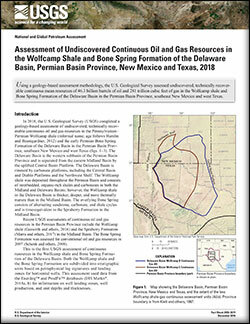 Schenk, Christopher J.; Mercier, Tracey J.; Finn, Thomas M.; Tennyson, Marilyn E.; Le, Phuong A.; Brownfield, Michael E.; Marra, Kristen R.; Gaswirth, Stephanie B.; Leathers-Miller, Heidi M.; Drake, Ronald M.
Schenk, C.J., Mercier, T.J., Finn, T.M., Tennyson, M.E., Le, P.A., Brownfield, M.E., Marra, K.R., Gaswirth, S.B., Leathers-Miller, H.M., and Drake, R.M., II, 2018, Assessment of continuous gas resources of the North Caspian Basin Province, Kazakhstan and Russia, 2018: U.S. Geological Survey Fact Sheet 2018–3051, 2 p., https://doi.org/10.3133/fs20183051. 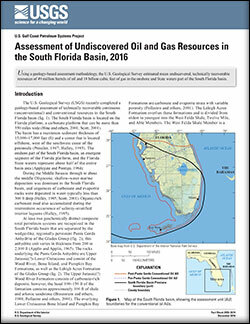 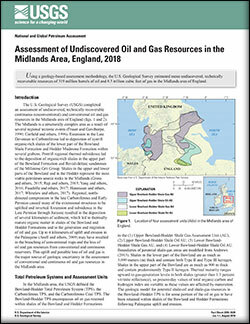 Using a geology-based assessment methodology, the U.S. Geological Survey estimated mean undiscovered, technically recoverable resources of 319 million barrels of oil and 8.3 trillion cubic feet of gas in the Midlands area of England. Schenk, Christopher J.; Tennyson, Marilyn E.; Mercier, Tracey J.; Woodall, Cheryl A.; Finn, Thomas M.; Gaswirth, Stephanie B.; Le, Phuong A.; Brownfield, Michael E.; Marra, Kristen R.; Leathers-Miller, Heidi M.
Schenk, C.J., Tennyson, M.E., Mercier, T.J., Woodall, C.A., Finn, T.M., Gaswirth, S.B., Le, P.A., Brownfield, M.E., Marra, K.R., and Leathers-Miller, H.M., 2018, Assessment of undiscovered oil and gas resources in the Midlands area, England, 2018 (ver. 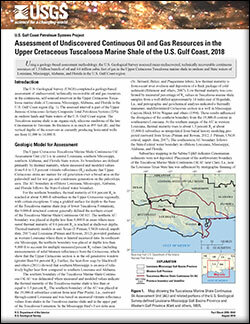 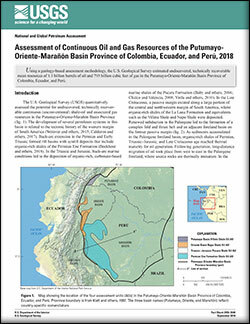 1.1, August 2018): U.S. Geological Survey Fact Sheet 2018–3028, 4 p., https://doi.org/10.3133/fs20183028.